Natural Wonders Learning Center is a new business opening up in the rural community of Greene County. Specifically located in Jefferson, Natural Wonders will focus on providing young children education through play. Learning centers can often be known for their sterile environments, often not leaving room for children to really learn through play. Natural Wonders Learning Center is setting out to do something that is not only different, but is child-centric. Children will be encouraged to learn through activities that utilize their creativity, challenge them through social interaction, and ultimately, give them the security and comfort that is often only found at home. Greene County struggles with childcare. A public plea was recently heard from town officials for more daycare facilities to be opened up. While there are many in-home daycares in Jefferson, Iowa, they are all full. Parents located in Greene County will be excited to know that a new option for them is opening up. This new option also allows their children to learn in a fun, and more “natural” way than is typically found through learning centers. 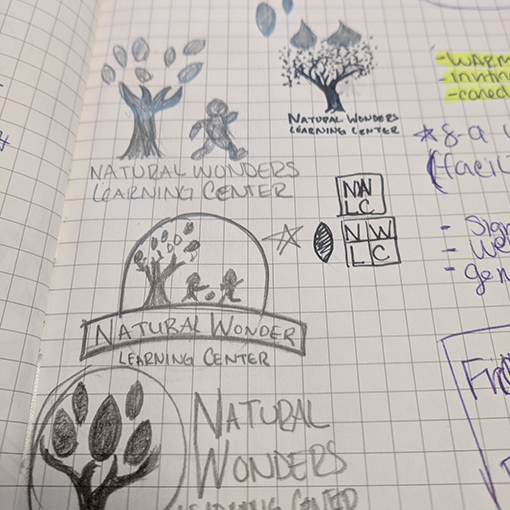 Natural Wonders Learning Center is a new business. With no previous branding to use as a base, it was important to discuss who would be utilizing their services and what those people would be drawn to. They provide daycare and educational services for families that want their children spending their days in a fun, caring environment – much like home. While they wanted to appear natural, trusting, and caring – they wanted to professional, more mature look. There needed to be a balance between fun and child-oriented with professional and trustworthy. They wanted earthy, muted colors that were calming. Often, child-related products and services use bright colors with more organic shapes. While they liked the idea of organic shapes, we agreed that the bright colors wouldn’t convey the emotions they were hoping to put forth with the new logo and branding. I first met with Nicole, one of the owners of Natural Wonders Learning Center, in November. We discussed what she was needing and what I could do for her. She had previously gone to another designer but it hadn’t worked out as the designer had copied the artwork instead creating something custom for the business. At the end of the meeting, we agreed on what she was needing. We met again a few months later when everything was in place and she was ready to go. Things can change in the span of a few months, so we reviewed the goals and purpose of the logo. I had Nicole fill out a branding workbook that I created in order to dive deeper into who she was targeting and what the goals of the business and branding are. After reviewing her answers and the notes I had made during our meetings, I was ready to begin sketching. I sketched rough ideas I had. These ideas stemmed from the research I had done on the market, the notes I had taken, and the workbook answers. Generally there are pages of ideas – some variations of other ideas or completely different from each other. I narrowed down the strongest solutions and refined those designs. In the video included in this case study, I am working on one of the ideas I had for the logo design. Refining my sketches in illustrator help me further work out a solution. Sketches allow me to weed through the cliched, weak ideas and focus on only refining ideas that meet the client’s goals. After refining a few of the logo ideas, I sent them over to Nicole to look over. Nicole filled out the approval form for the first round of revisions. I then reviewed the feedback from the client and narrowed down the designs even further. In total, the logo took about a week and half to two weeks to complete. I also included a branding style guide. 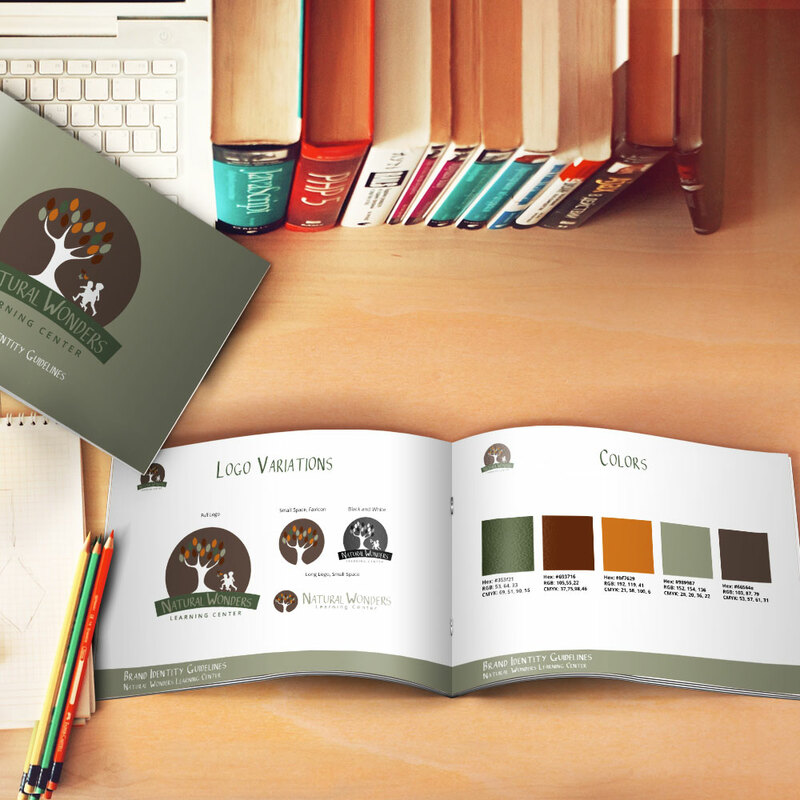 This guide outlines how the logo, typography, and colors should be used throughout various marketing materials in the business. Style guides create consistency within the brand and make onboarding new employees much easier as they will have a resource to refer to when needing to design pieces, send letterheads, etc. Using the silhouette of children and tree to symbolize growing and learning, we paired that with an organic shape. This allows the logo to be versatile and scalable. We went with muted earthtones to create a warm and inviting feeling. We wanted to convey trust and likability while also being professional. The typography of “Natural Wonders” is a more organic and free-handed style. It’s not quite childlike, but it gives a feeling of freedom, exploration, and nature. We decided to pair this with a sans serif. The straight lines balance the rounded and organic shapes found throughou the icon and typography of the top line. With the curves balanced by the straight lines, the logo tells a story of a business aimed to care for children, to care for their exploration, and that this business can be trusted to meet the needs of the children.